Below is a series of flowers that I've created as stained glass mosaics. All of the designs were hand drawn by me for this specific project. 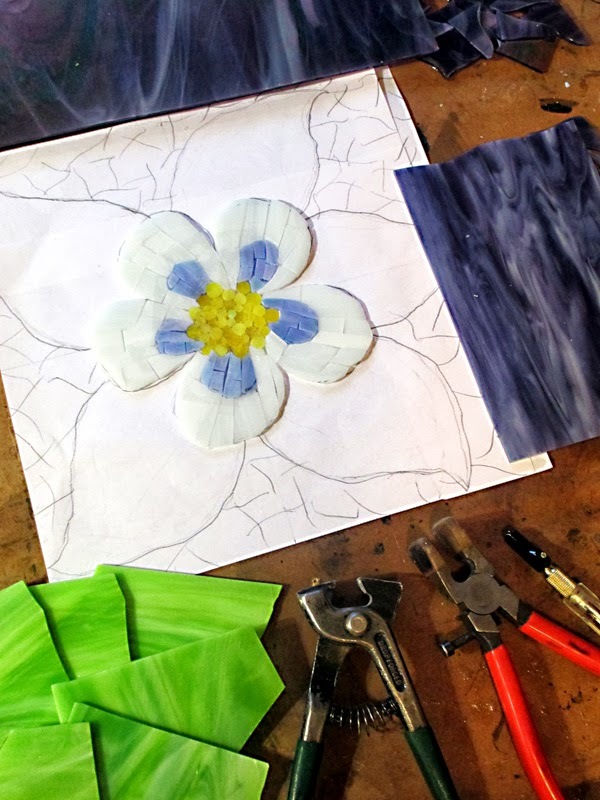 All of the glass in each mosaic is completely hand cut by me with basic hand tools: the pencil grip glass scoring tool, the running pliers, the flathead tile nippers and the wheeled nippers. 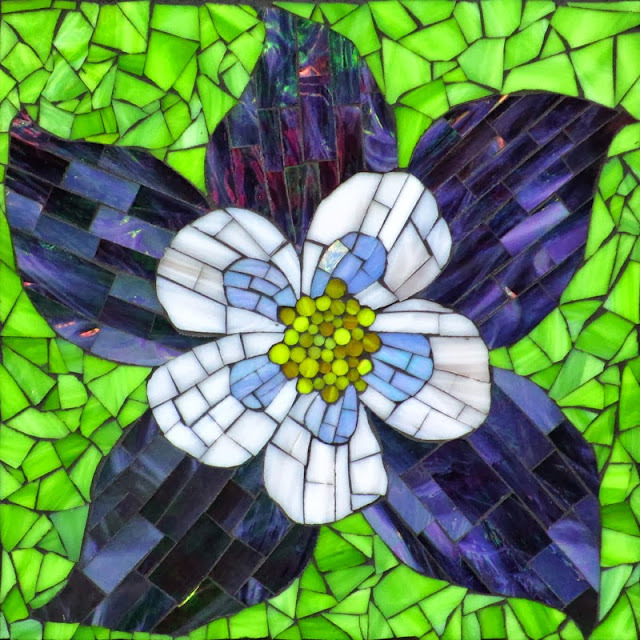 Visit my open facebook page "Kasia Mosaics" to see lots more up to date process shots as well as new projects and news about my Online Stained Glass Mosaic Classes which are available for streaming world-wide - hope you take a look and enjoy! Watch the video below if you are interested in learning more about stained glass mosaics. It is a preview of my Online Stained Glass Mosaic Flower Class which is ideal for complete beginners as well as intermediate mosaic students. The Online Class comes with 12+ flower templates that can be used for the class projects. It covers my mosaic process from start to finish, covering every step of the way. Everything is documented via video tutorials that are supplemented with additional photos and written notes. The students in the class are invited to a private facebook group page where they can ask for advice and feedback on their work as well as interact with other students and to share their progress as well as finished projects. 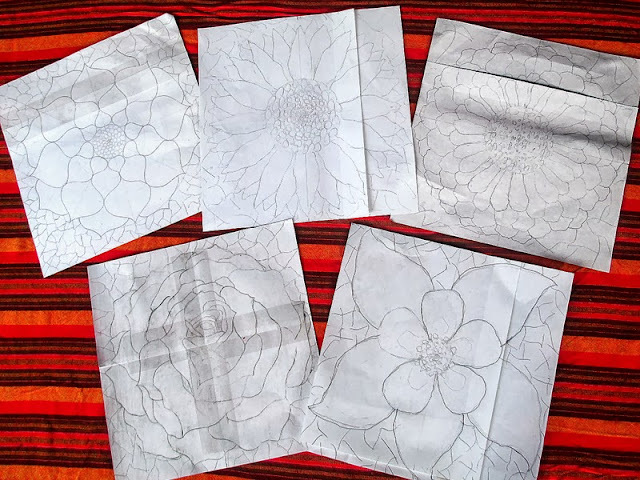 Above are the rough sketches I created for the mosaics. Here is a shot of the lotus in progress. The lotus is a recurring element in my work. I've been wanting to make a purple one for a long time now so here it is! 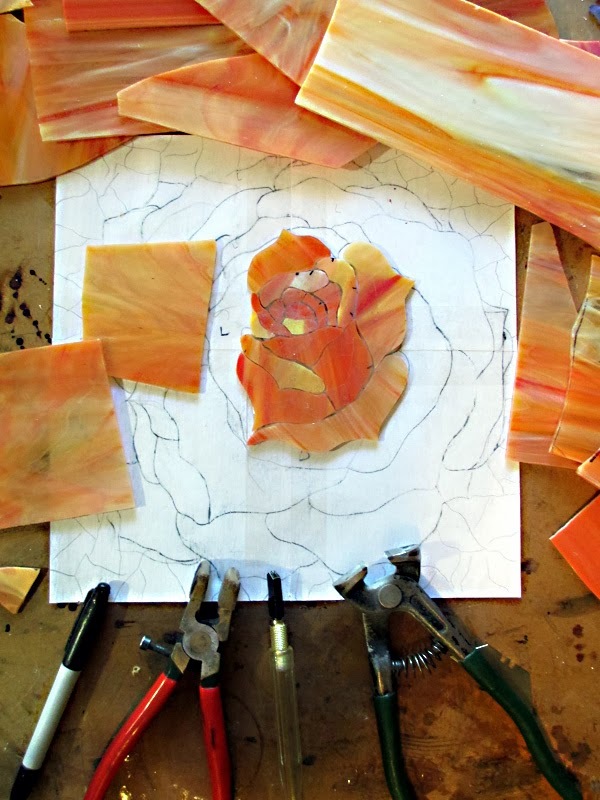 Here is a shot of the rose in progress. I've always really loved roses but if I had to choose which one I love the most, it might be the orange one. Here is a shot of the Colorado columbine in progress. Through out the summer on various hikes here in the mountains of Colorado, I have seen these beautiful flowers along the trail and was inspired to create one of my own. Here is a shot of the zinnia in progress. Zinnia's are Kyle's favorite flower to plant in the garden. He is really the one who has brought it to my attention. Seeing how much he loves these flowers, I just had to include it in my series. 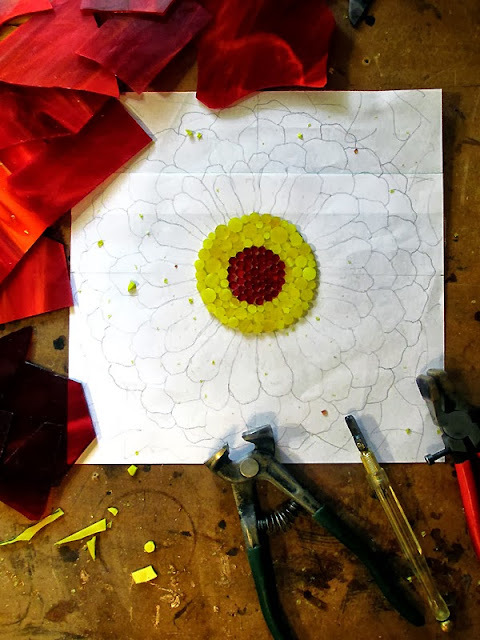 I feel that every part of the flower lends itself perfectly to being recreated with a mosaic pattern. This flower was particularly fun to create and I plan to revisit it in a variety of colors in the future. Above you can see part of the grouting process. I grouted all the flowers at the same time. Seeing them all come alive at the same time was very rewarding. 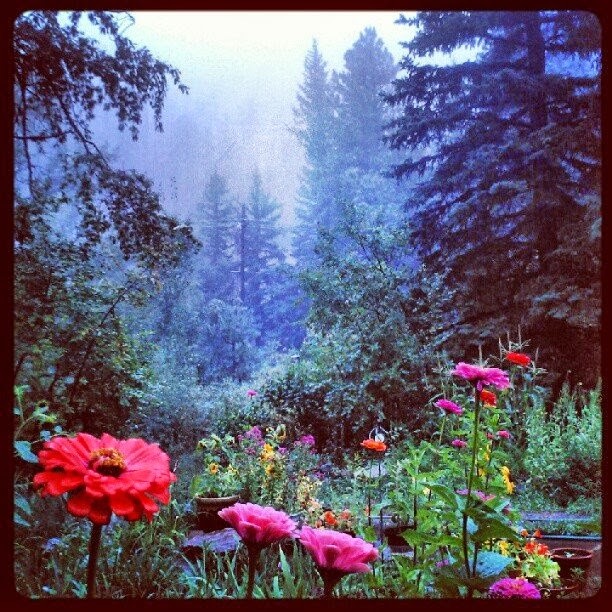 Here is an Instagram shot I took of the view from my studio window while finishing up my mosaic flower project. Part of Kyle's stair garden is seen framing the beautiful view of the trees I get to enjoy everyday. Though out the summer, we watched the flowers blossom and attract the humming birds - it really was a treat and it inspired this little series. In September I took this photo thinking about how beautiful the rainy day was and how it made the flowers really stand out. At that time, I had no idea how much rain we were going to get in Boulder - that was the beginning of the big flood before we had to evacuate from our home. I had to put my project on hold while we were displaced. Eventually we got to visit our home for a few hours at a time and I got to come back to glue the flowers on day and then a few days later we came back to grout. Despite all that we had to deal with as a result of this natural disaster, I had to do my best to complete my project and it felt really good to sneak in a few hours of studio time during the five weeks we've been away from our home. Thank you so much for the nice comments and for the good wishes! I have been doing crafts of different kinds all my life but have never been artistic. Is is possible to do stained glass mosaics and mosaics in general without being artistic? I have patterns that I came across in a book at a craft store and hope it helps. I am going to start traveling with my horses to see the country and am going to take my new craft with me as well as a few old ones. I love your work and only hope mine is half a beautiful as yours. Thanks for sharing and I will send you pics of some of my work as I evolve. Yes ofcourse it is possible to make mosaics without being too creative. Working on top of patterns is a great way to go if you are unsure of coming up with your own designs. 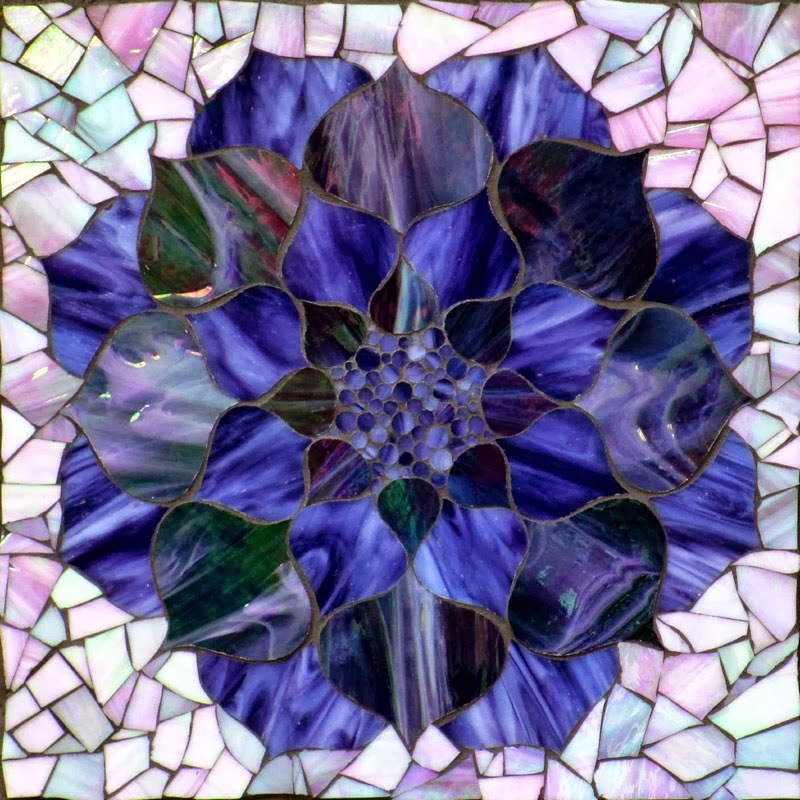 I hope that you've been busy making mosaics, improving your technique and gaining more confidence in your ability. I love your work! Very inspiring! Where do you get the lovely panes of glass that you're cutting into various shapes? Thanks, keep up the good work! I purchase my glass at D&L Art Glass (wholesale warehouse) in Denver, Colorado. 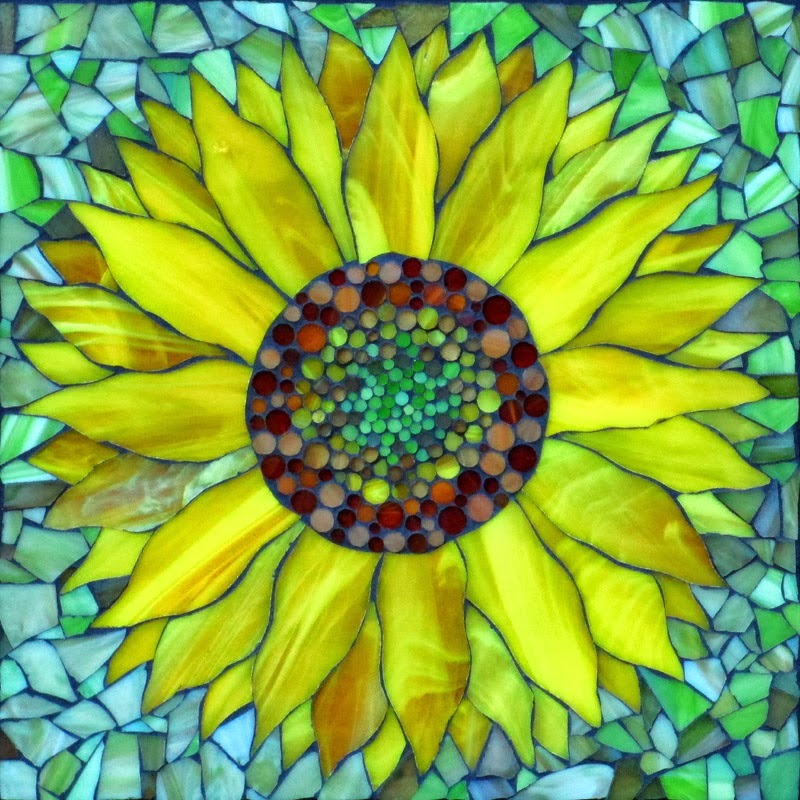 But you can purchase stained glass in many glass shops as well as online. Here is a link to a good online supplier: http://www.delphiglass.com/spectrum-glass/streaky-wispy/ The kind of glass that I used for the above flowers is from the Spectrum Glass Company from the 'Streaky and Wispy' family of glass. 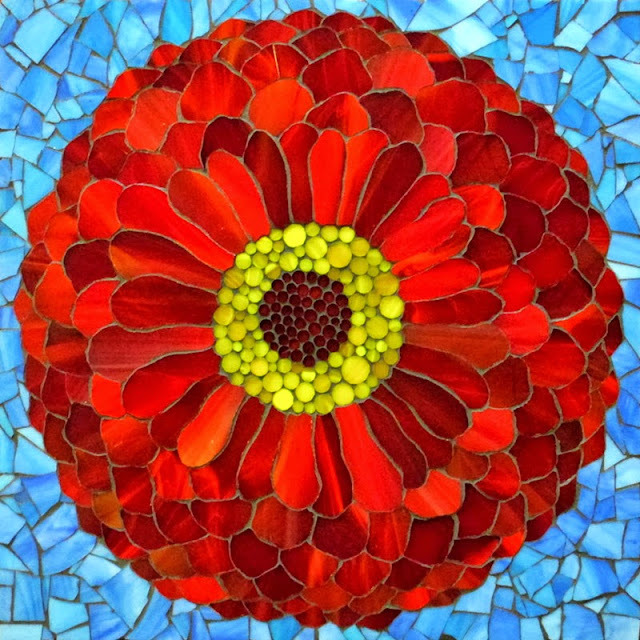 If you ever want to give mosaics a go and create your own flowers, I do offer an Online Flower Class. You can read more about it here if you're interested: http://www.kasiamosaicsclasses.com/course/online-flower-class/ Thanks for the compliment! Thanks for the compliments on my work! 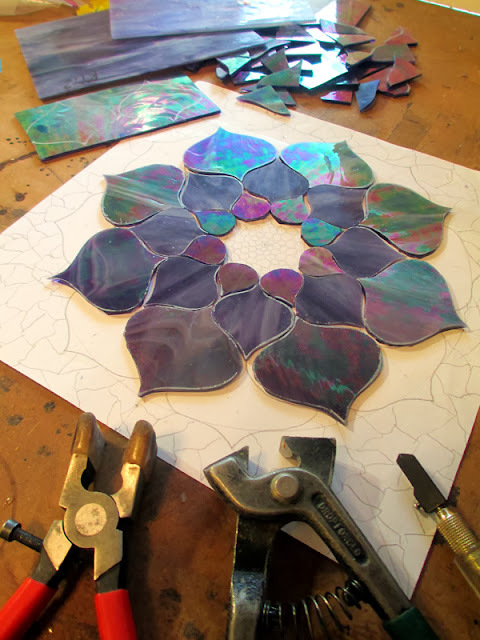 In regards to the flower petals in the mosaics above, I use a glass scoring tool and running pliers to create the shapes. With the right technique it is actually very doable. 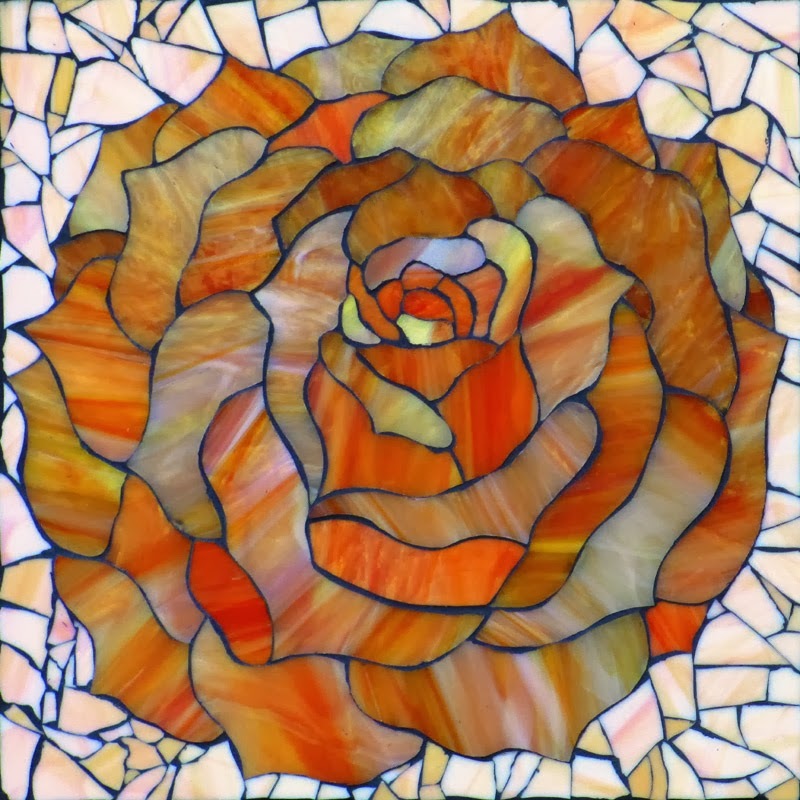 But I don't use tile, I work with stained glass which comes in many lovely colors. I do have an Online Flower Class that specifically focuses on teaching this kind of glass cutting and it comes with many project templates and tutorials for the different designs. Check it out via my classes page: http://www.kasiamosaicsclasses.com/course/online-flower-class/ Just copy and paste the link in your browser. The best tip I can give you is to know how to use your glass cutting tools properly. As long as you get a hang or it you can cut many fun shapes. Best of Luck! Can you give me some tips on how to cut those petals , especially the lotus ? Do you use a different tool than normally used ? The best tip I can give you is to become comfortable with using glass tools and to understand how they work as well as what not to do with them. With a little bit of practice, any beginner can start cutting nice shapes out of glass. I just use the basic tools: a pencil grip glass scoring tool and running pliers. Then I use a flathead tile nipper for any shaping and circle making and the wheeled nipper to make the background shapes. I have many other useful tips that I've included in my Online Flower Class. 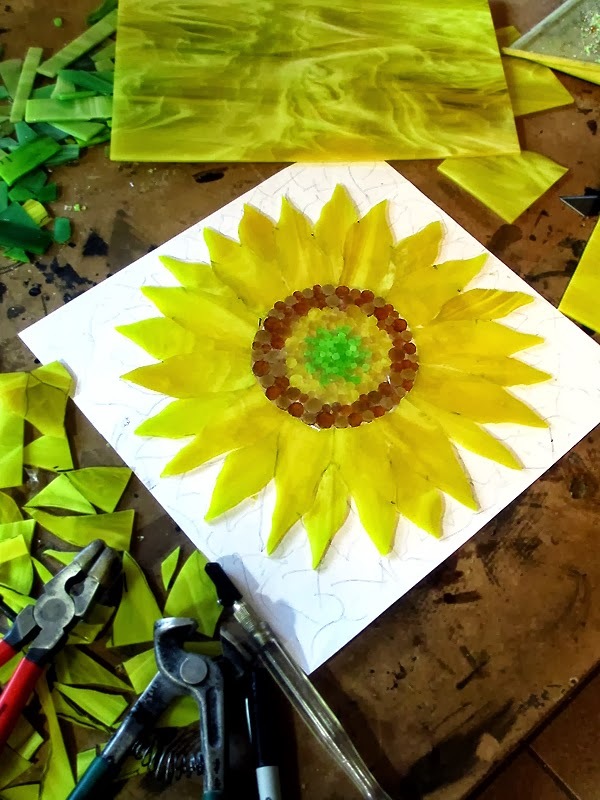 I go through showing how I use the tools, go through a flower project from start to finish, include additional tutorials on specific petals and I share a set of flower templates for the students. You can read more about the class and watch a preview video here: http://www.kasiamosaicsclasses.com/course/online-flower-class/ Best of Luck! What type of wood product do you use for the base of your mosaic art? I want to use a sturdy enough base and not just plywood.